Today I got an email form a newbee regarding some help in SQL Server. His question was a typical “SQL Server Interview Question”: What are the various ways to get SQL Server version number? Check the INSTANCE name in SSMS Object explorer. It shown SQL Server Version Number in brackets, like: (SQL Server 10.50.4000 – DOMAIN\user). 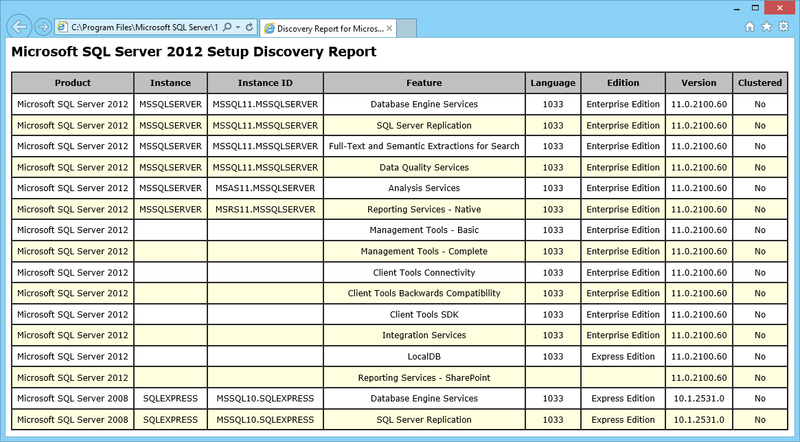 Check by “SQL Server Features Discovery report”. A window will open, click on Toolsat the left navigation bar, then click on “Installed SQL Server Features Discovery report” link. Simply, in SSMS go to menu, Help -> About. You will get a pop-up window which shows version number of difefrent Components installed as a part of SQL Server installation. To my previous comment about version/build numbers, here is an error when trying to apply a CU patch for SQL 2008 R2 SP1. A SQL Server update with a higher version has already been installed on SQL Server instance MSSQLSERVER, so the current SQL Server update cannot be applied. The version of the SQL Server update that is already installed is GDR 10.51.2550.0(10.51.2860.0) with a KBKB2716440 and the current SQL Server update is 10.51.2769.0 with a KBKB2544793. Even though in server management it displays 10.50.2550 – . Does not allow one to apply any patches. After SP1 of SQL server 2008 R2, the versions displayed by Select @@version and that displayed by running the SQL Server discovery report are different. SQL DBA – Moved MASTER database by ALTER DATABASE statement? here’s the solution Security Compliance Manager (SCM) 3.0 now available for beta download!